Who said: "If there is anything more dangerous to the life of the mind than having no independent commitment to ideas..."
"If there is anything more dangerous to the life of the mind than having no independent commitment to ideas, it is having an excess of commitment to some special and constricting idea." 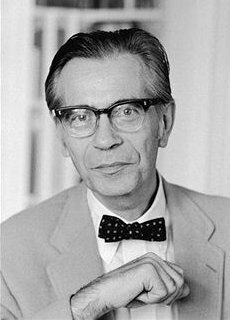 Richard Hofstadter (1916-1970) was born in Buffalo, New York to a Jewish father and a German Lutheran mother, who died when he was 10-years old. He majored in philosophy and minored in history at the University of Buffalo. The town of Buffalo was suffering from the full impact of the Great Depression at the time which strongly colored his thinking on political and intellectual matters - he became involved in left-wing politics and joined the Young Communist League, which is where he met his future wife, Felice Swados. However, by 1939 (about a year after joining) he had become disenchanted with the Communist Party, and after the Nazi-Soviet pact in September 1939 he became permanently disillusioned with it, the Soviet Union and Marxism. However, he remained deeply cynical of capitalism. In 1942 he completed his dissertation (published in 1944 as Social Darwinism in American Thought, 1860-1915); two years later he joined the faculty of Columbia and in 1959 he was named DeWitt Clinton Professor of American History. He became one of the leading historians of his generations - at the time, progressive historians were inclined to explain American history through the prism of economics; but Hofstadter described it as essentially irrationally motivated - emphasizing unconscious motives such as status anxieties, irrational hatreds, and paranoia. In some of his works, such as The Paranoid Style in American Politics and Anti-intellectualism in America, he described American society as a whole as extremely provincial, harboring widespread fears of any ideas outside the mainstream, and described a direct lineage between the Salem witch hunts (17th century) and the McCarthy era (early 1950s). He planned to write a three-volume history of American politics but died at age 54 from leukemia having partially completed the first volume, which was published posthumously as America in 1750.